As of this week, I've seen Romeo and Juliet nine times in some form or other (not counting West Side Story, its most successful adaptation). 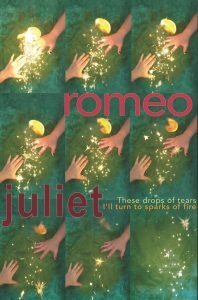 Not because I particularly love Romeo and Juliet (although I still remember a few lines I memorized in high school English class many years ago). But because it's done a lot (the Guthrie is opening their season with it this fall). So why do it again? Why see it again? Romeo and Juliet still fall in love at first sight. Romeo still kills Tybalt. Romeo and Juliet still react to his banishment with despair rather than just running away together. And the friar's stupid messenger still fails to deliver the message, resulting in the senseless death of both of these teenagers. But there's a reason it's done so often and has inspired so many adaptations (the latest being James Corden and Emily Blunt's musical version). It's a story of love, crazy stupid irrational love, in the face of hate and violence. Mission Theatre Company promises a Romeo and Juliet like you've never seen before. And they deliver, with an energetic and physical adaptation that builds from romantic comedy to tragedy over two intense hours with no intermission. When the cast walked out with glittery mask-like make-up around their eyes, I thought for a second I was at Midsummer. This production almost has the dreamlike fairy quality of Shakespeare's most famous comedy rather than his most famous tragedy. 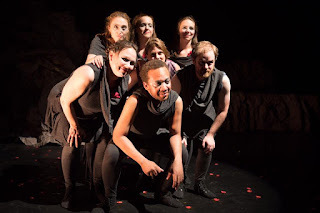 The six ensemble members, some of whom double as characters, often act as a chorus onstage, sometimes reciting a few lines, sometimes singing, and more often silently moving around the stage adding to the emotion of the scene. Another unique feature of this production is that under director Penelope Parsons-Lord, the cast delivers many of the lines with a pause after the first word, typically a preposition or conjunction. It's an interesting take that allows the audience to experience these familiar lines in a different way, and creates a sense of antici... pation. The strong young cast is led by Bethany McHugh and Vincent Hannam (reminiscent of a young T.R. Knight), who make a charming Juliet and her Romeo, full of youthful energy, innocence, and passion. Typically there are only three roles for women other than Juliet: her mother, her nurse, and Romeo's mother. Mission Theatre has remedied this imbalance by casting women in some of the male roles, including Romeo's pals Benvolio (Ashley Hovell) and Mercutio (Tamara Koltes). They changed some of the pronouns, which probably wasn't necessary, but the switch totally works and should be done more often in these classic male-heavy plays. Other highlights in the cast include Amy Vickroy as Juliet's boozy housewives-esque mother, John Stark bringing a bit of comedy as the pompous Paris, and Eric Balcerzak as an almost too violent and scary Lord Capulet. The story unfolds on a multi-level set that looks less like buildings in a city than rocks in the wild, adding to the dreamlike fairy quality of the production. Each time a character dies, red rose petals are strewn over them; by the end of the show the stage is littered with rose petals. The cast is dressed in fairly simple costumes, including cool black sleeveless tunics with a hood/cowl for the ensemble, and tunics or dresses with a little bit of sheen for Capulets and Montagues (set design by Leazah Behrens, costume design by Penelope Parsons-Lord). Recorded music and live singing with a sort of '60s vibe is used sparingly throughout, including the songs "Do You Believe in Magic" and "You'll Be A Woman Soon." In experiencing the divided city of Verona, I couldn't help but think of our divided nation. Today's Capulets and Montagues are Democrats and Republicans, liberals and conservatives, blue states and red states, and anything else we use to divide the world into us and them. A plague on both our houses if we can't figure out a way to work together, to choose love over hate, like these two foolish and brave children. Romeo and Juliet continues at the Crane Theater through June 17.